AR500 Armor® ABS was developed to satisfy the growing demand for modular protection of the abdominal area. We set out to create a modular auxiliary armor system that could integrate with your existing plate carrier and body armor. Our Abdominal Ballistic System offers a unique blend of flexibility, modularity, and protection from rifles or pistols dependent upon the body armor insert you choose. AR500 Armor® ABS attaches via our unique pouch design, integrating into your plate carrier’s cummerbund flap or inner plate pocket. Secured via Velcro, or option modular attachment straps, ABS provides a natural fit with your existing body armor resulting in a user adjustable extension of your body armor. Pouch Size: 10.25" x 7"
Armor Size: 9.5" x 6"
Level III ABS Body Armor features a natural curvature matching that of our full size chest plates creating a transition between plates. All ABS hard armor includes an integrated ABS profile PAXCON Build Up coating for spall & fragmentation mitigation. By design, our level IIIA ABS soft body armor naturally curves to your body when installed in the ABS pouch. ABS is compatible out of the box with all plate carriers which feature an open bottom cummerbund flap; and all plate carriers which feature an internal armor closure flap. If the cummerbund flap wraps around the bottom of the front plate pocket, the ABS Modular Adapter Kit is required. Base Adapter (built-in): Velcro attachment flap which attaches to the inside of your plate carrier pocket, or the inside of your cummerbund flap. ABS Modular Adapter Kit: Attachment straps with G-hooks designed to loop through existing PALS webbing on the front of your plate carrier. Works in conjunction and does not interfere with your ability to run MOLLE pouches on your plate carrier. G-hooks attach to the ABS pouch, and the base Velcro attachment flap cleaning folds into the ABS pouch for storage. Build in attachment loops also allow for custom user attachment or can be used as additional attachment points. 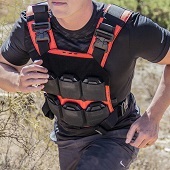 *The Abdomen Ballistic System (ABS) is not designed to overlap with your existing chest plate, but to offer increased protection to your abdominal area while maintaining mobility, and allowing full functionality of the PALS webbing. It is normal & intended to have a gap between your chest plate and ABS body armor insert.